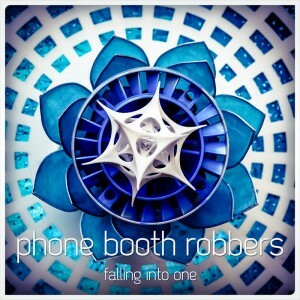 Omnitropic presents Falling Into One, the debut full-length album by Phone Booth Robbers (Bastiaan van Staaveren), a psychedelic downtempo project from the town of Hoofddorp in The Netherlands. Phone Booth Robbers began creating music in the mid-nineties, gradually shifting from early trance music to richly melodic downtempo and electronica inspired by acts like Shpongle, Ott, Bluetech, Ozric Tentacles, and Easily Embarrassed. Mastered by Jeffrey van der Schilden at EE Music Studio, The Netherlands, with photography by Steven Willis. MP3 Download | FLAC Download | WAV Download · Download count: 18,377. Another great album was born ! World class! This ranks with Hinkstep’s Sunrise From The Treetops, Globular’s A Self-Fulfilling Prophecy, and Sephira’s Imagination In Motion. Ektoplazm’s downtempo game is off the charts this year. Excellent well done album Mr. Bastiaan&team. Its deep sounds and mixtures are giving a great and complete structure to a good quality trance. It was playing from 1 to 12 without stop, Nice listening and meditative atmosphere. I’m glad I got the news note about this update. Thanks guys for making this music available!. Beautiful arrangement. Perfect blend of sound dimensions. Listened to it from start to finish without neg criticism and that is very rare for me. Absolutely beautiful. Usually I don’t like downtempo at all (too boring in most times), but not this time. It sounds great! exceptionally awesome I tell you! stuff like that has to happen more often. This year ektoplazm has very good quality in downtempo music :) keep the good work. I’ll put many song from ektoplazm releases in my festival dj sets. Damn this is a quality release. Good job! Let’s make music together. The spring has come. Great!! Thank you all very much for your kind comments! That first track really caught me off guard, and unlike a lot of other albums where I find the first one of the few good tracks, it kept them coming. The cave metaphor in Six Hour Holiday is amazing, definitely working that one into my memory. I’ll be listening to this a lot. Great work! If I had to name favorites so far I’d say “Signals From Inner Space” and “Short But Untold Stories”. But I really like all of them. Though I should probably also mention “I Can’t Sleep Because You Can”, which is very good. Also, I like the cover. When I first looked at it, I thought it was CG. it’s early in the year yet, but I think you just gave us the release of the year. last thing i remember being so beautiful was hinkstep’s sunrise from the treetops. absolutely amazing work, hope to hear more from you in the future. My first Summer Favourite. Greasy Mechanism! So Genius Track ! “I Can’t Sleep Because You Can” is just over the top perfect, and the album in whole is an amazing experience. Waiting to see more! This album offers a lot of diversity and interesting downtempo progressions. Every song offers more twists and turns, developing bass lines and euphoric synth leads across every direction. The song “Circuit Bending The Universe At Your Desk” really takes me on a uplifting journey. “The Hills Of Faraway” puts me in a constant groove. Every track has something new to offer. This album is definitely not repetitive and it steps outside the normal boundaries. Evolving atmospheres, wonderful voice samples, and progressive soundscapes mixed with wonderful pads are the backbone to the chill out, yet head-bumping, harmony presented in this release. Well mastered and well thought out. Great hidden masterpiece! Really really love the sounds of this album!! Of course we all like it and already playing it on radio! I want to meet the sweet specters in “Dangerous Creatures”! This album is an amazing story! Wow! Thanks for this great “birthday present” release! I Was Lucky, i found this by acsident , and it,s worth Gold!! Killer album…best so far this year. Best album in this year now. Thank you very much guys! this release is perfect as it is. all in harmony… congratulations Bastiaan! We call this “de krenten in de pap der muziek”, which means something like “the icing on the cake of music”. Phone Booth Robbers gives us mind-boggling sounds from outer space, especially meant for psychedelic recreation. Mandatory music for all the floating souls out there. Great to see such quality stuff coming from my home country. Keep it up! I like it :D Very good! What can I say ? Is this the finest debut to grace the halls of Ektoplazm ? Better than Globular’s debut ? In terms of tracks to quality ration I thinks so ! There isn’t a weak track to be found. Two super big thumps up to you. Please sir, can I have some more ? this is some seriously well written and produced music. stellar mixing and mastering as well. top notch! keep it coming mate! This is brilliantly produced and written.unpredictable,captivating on acid.its a chill session that you can move to.greasy mechanism is so satisfying, it has all the elements, so tightly executed.so refreshing to hear different beats.i can’t stand repetitive crap like globular, reggae died of lung cancer years ago.well done.i would love to hear more.or some related material that any one can recommend.cheers. I agree I usually pass on downtempo as I think a lot of it is well not nori g but lacks emotion and a well defined beat. Almost as if they don’t take drums and percussion seriously just layering stuff over the “downtempo beat sound pack” that comes standard with any synthesizer. Nice job guys the effort shows and I would love to hear more. Preferably live. One of the best finds if not the very best one indeed. Thanks so much for this great piece of art. This is an amazing album. I found out about you guys from reddit. Hi all, thanks again for all your love. Spread the word… ;-) Peace! This is ridiculously good quality, honestly one of the best albums on Ekto. This album fantastic journey of sound! Thanks! I stumbled upon this release by accident while listening to Shpongle on Youtube. It’s been a while since I have heard something this good. This is seriously an awesome release which is on par with the artist that it was inspired from. It also made me want to donate to ektiplazm. It’s been a long time I downloaded this album, and you can be sure that I often listen to it. I find a lot of simplicity, seduction and sensuality in it… a simple auditive message for a great sharing… thanks a lot ! this is just incredible! thank you so much! Absolutely fantastic album! Decided to download after hearing PBR’s on an Ektoplazm compilation and so glad I did. One of my best dl’s. Thanks artist and Ektoplazm. Look forward to new releases. Very nice!! How did I miss this one until now? Brilliant. This album comes in mind regularly when I want to listen to some downtempo music with a distinctive and unique sound far from i-have-heard-that-thousand-times-before. Incredible piece of work with a touch from the soul of it’s creator! And it feels like that without questioning. Never heard that artist before this release, but hoping to hear more soon.